Dubai: It was India’s day at the Dubai International Stadium in the fifth match of the Unimoni Asia Cup at the Dubai International Stadium. They dominated the match from the start in all department of the game to record an easy eight wicket win over their arch rivals Pakistan. After Hong Kong had given India a fright on Tuesday, it was India that should have been under pressure. Pakistan, showing no signs of being the Champions Trophy winners, struggled in their batting while their bowlers failed to even put on a fight back. Pakistan’s batting cracked before the spirited Indian bowling combination of Bhuvneshwar Kumar, Jasprit Bumrah and Kedar Jadhav. Kumar and Jadhav took three wickets each, well backed by Bumrah with two wickets. The mighty Pakistan batting line up were bowled out for 162 runs in 43.1 overs. Except for Babar Azam (47) and Shoaib Malek (43) none of their other batsmen stayed at the wicket long enough to lift Pakistan out of trouble. Indian then raced to victory through elegant batting from their skipper Rohit Sharma and Shikhar Dhawan. They put on a 50 runs partnership in just 8.4 overs with Sharma punishing Usman Khan through sixes while Dhawan played second fiddle. Dhawan too began to open out hooking Hasan Ali for a six. The ease with which Indian openers demolished the Pakistan attack enthralled the Indian fans. Sharma’s pull shot off Ali for a six into the crowd was brilliantly hit. He reached his half century in 36 balls. Leg spinner Shadab Khan ended Sharma’s innings of 52 with a beauty than went through his defence to hit the stumps. The opening pair put on 86 runs in 13.1 overs. At the score on 104, Dhawan slashed Ashraf in the air to Babar Azam at point for 46. India then needed only 59 more runs. Dinesh Karthik, who joined Ambati Rayudu steered Indian to the target in the 29th over. Nothing went Pakistan’s way, except the toss. 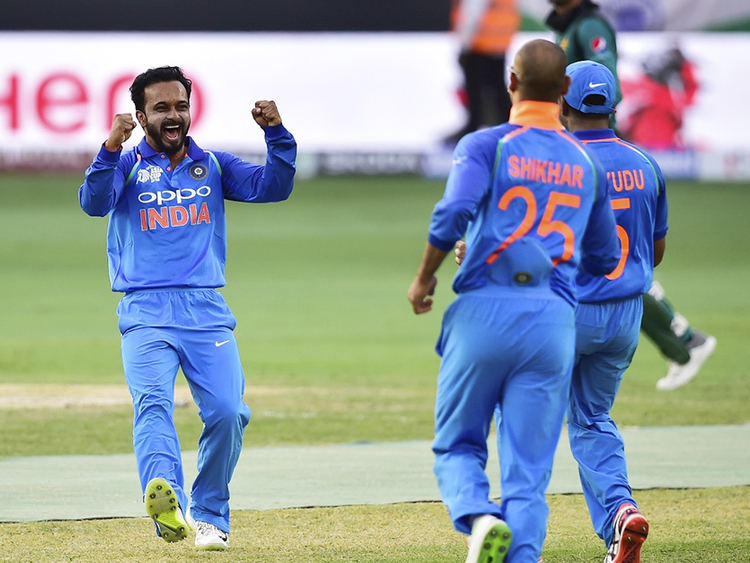 India picked an early wicket when Kumar struck with the first ball of the second over by having Imam Ul Haq, who swung at rising delivery, and got caught behind by Dhoni for 2. A roar erupted from the Indian fans applauding the dismissal. Hardly had the roar ended, Kumar struck again in the fourth over by having Champions Trophy hero Fakhar Zaman out for a duck. He top edged to be caught by Yuzvendra Chachal at mid-wicket. In walked the experienced Shoaib Malek, who has hit 143 and an unbeaten 125 against India in the Asia Cup, to join Babar Azam. In the seventh over, Azam hit Kumar for two successive boundaries. The first was a straight drive with elegance and timing to beat the mid-off and the second he punches it square to beat the cover point. 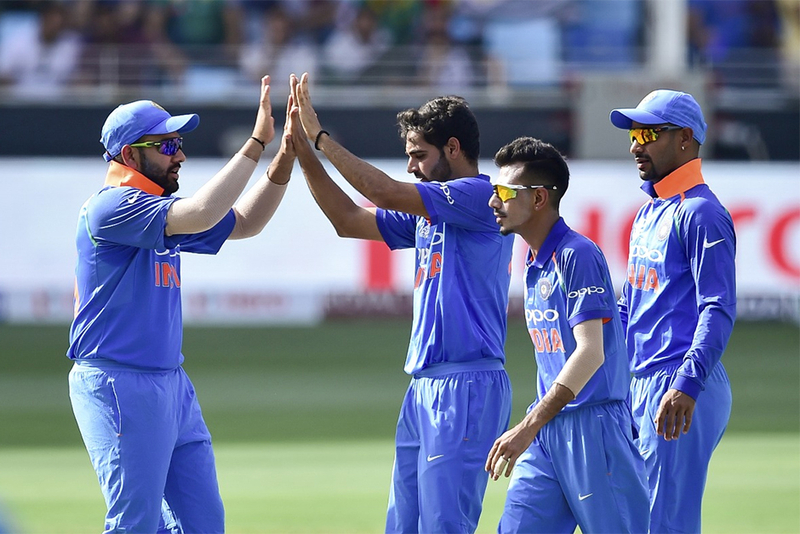 India introduced their leg break googly bowler Yuzvendra Chahal in the 11th over and Azam played a lovely punch beating cover and long-off for another boundary. India’s left-arm spinner Kuldeep Yadav was introduced in the 13th over and Malek brought cheer to the Pakistan crowd by hitting him for a huge six to deep square leg. By the 15th over, Pakistan were 57 for 2. Malek on 26 escaped being caught behind when he attempted to run Hardik Pandya to third man and edged to wicketkeeper Dhoni, In the 18th over, Pandya slipped while completing his follow through and had to be stretchered off. In the 22nd over, Yadav clean bowled Azam for 47 with a deceptive delivery that hit his off stump. Yadav would have got Malek too out in the 24th over had Kumar not misjudged slog sweep to mid-wicket. Skipper Sarfraz Ahmad scored only six runs before he was brilliantly caught by substitute Manish Pandey off Kedar Jadhav, Pandey, despite getting his hands on the ball was about to run over the rope but threw the ball inside and came back to complete the catch. Malek on 43 got run out through a brilliant direct throw from Rayudu at point to non-striker’s end and Pakistan slipped to 100 for 5. Asif Ali lifted Yadav for a huge six over long on but Jadhav hand him caught behind for 9. With 20 more overs to go and score reading 113 for 6, India moved into a commanding position. The mantle of lifting Pakistan fell on allrounder Faheem Ashraf and Shadab Khan but they added just 11 more runs before Jadhav had Shadab stumped for 8. Ashraf escaped being caught bowled by Chahal on 13. Mohammad Amir on 10 too was lucky when his slog shot off Chahal fell short of Shikhar Dhawan’s at mid-wicket. The pair steered Pakistan past the 150 run mark in the 39th over. The pair put on 37 runs in 8.1 overs before Ashraf holed out to Dhawan at mid-wicket off Bumrah for 21. Next man Hasan Ali too did the same hitting straight to Dinesh Karthik at mid-off for 1 while Bumrah clean bowled last man Usman Khan Shinwari for a duck.